It was a Facebook inbox message from a friend I responded to with haste. The request came from my friend and mentor Dawn Sutherland. She now lives in Ghana. 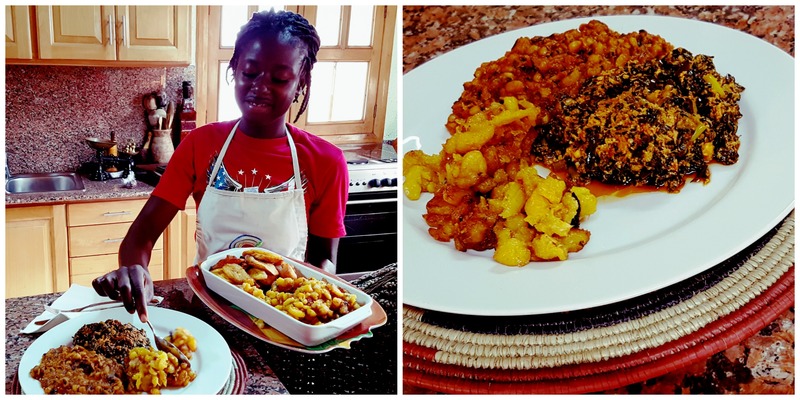 I was honored to create a recipe that she could actually use in that many of the recipes on my blog aren’t easily adapted because some of the ingredients aren’t available in Ghana. More about the recipe later. When Dawn Sutherland, Vice President and Controller for the United States Solutions Group’s Western Sales Operation for Xerox, retired after a distinguished 32 year career she went back to a place that captured her heart and imagination when she was a college student. It was a place she knew she could use her skills, talents and connections to feed the souls of those with the greatest need. That place was Ghana. That day came in May 2014. 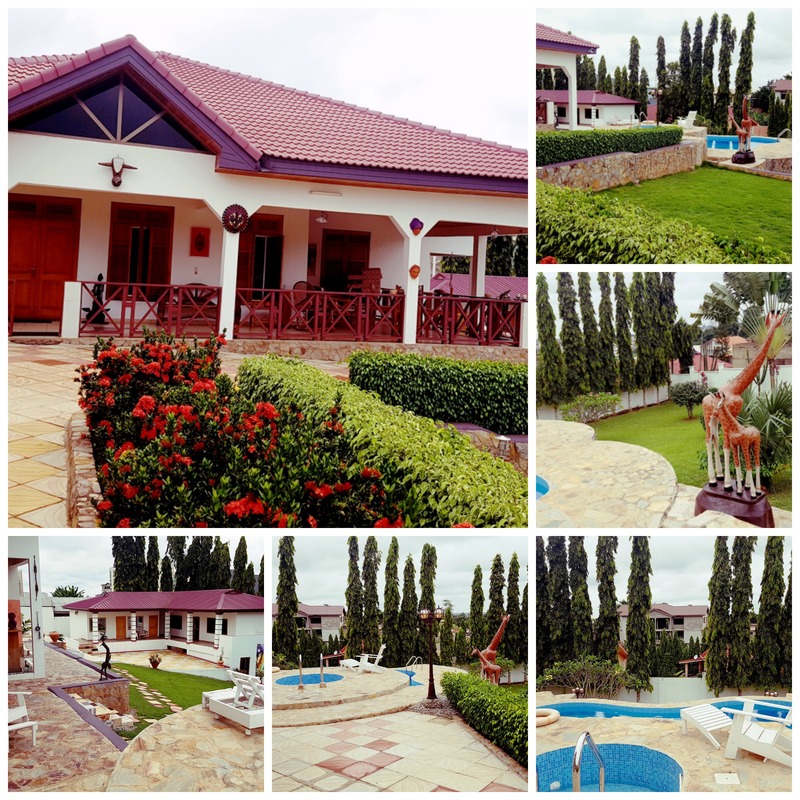 She decided after all the years of visiting Ghana, it was time to make the move. Dawn said good bye to her long time partner, family, friends, business associates, and her social and philanthropic affiliations she had cultivated over her lifetime. She packed up the contents of her scenic Baldwin Hills home in Los Angeles and shipped them in a container to a home she had purchased in Kumasi, Ghana in 2007. “I truly enjoyed a great life working for Xerox and I had a great network of friends in Los Angeles. But I would often wake up in the mornings and ask myself, how many more galas and fundraisers can I attend?” said Dawn. “I was being pulled emotionally to move to Africa to do whatever I could to help,” continued Dawn adding that her connection to Ghana was deepened after a DNA test revealed her Ghanaian ancestry. Life in Ghana has been an adjustment for Dawn from the food to politics, and everything in between. Dawn’s astute executive skills mastered in corporate American served her well in navigating the patriarchal culture in her new community where the role of women is more traditional. It wasn’t long before she was working with Chefs and government officials and community leaders on various community projects. Shortly after she arrived, she did something residents were unable to do. She arranged to have a hilly, dirt road in her community leveled and paved with asphalt. Now cars can use it. Dawn says not a day goes by without her neighbors thanking her for fixing a road that had basically been unusable and had become a health hazard. Left: young girl Dawn met on the road who was sacked. Right: neighborhood children outside of Dawn’s home in need of school fees. It was an unfamiliar phase that Dawn learned to understand quickly. During her morning walks she would often see children dressed in their school uniforms sitting on the side of the road. 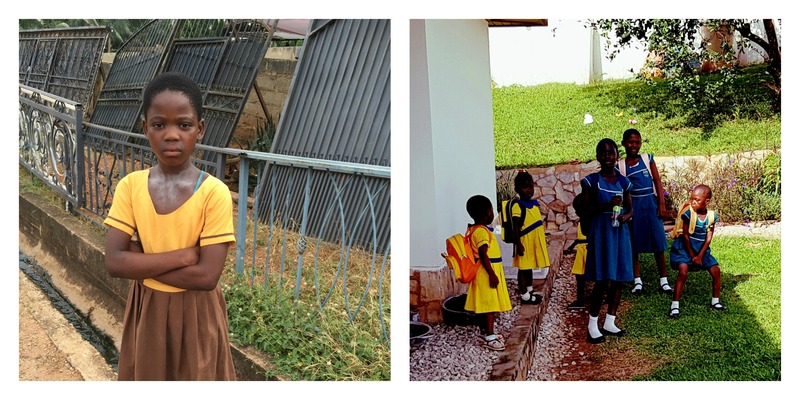 When she asked them why weren’t they in school, they said they got “sacked” which means they were turned away from school because they didn’t have their school fee of 2 Cedes (Ghanaian currency) which is equivalent to 50 cents. While public school is free, fees are required to cover cost such as security, books and canteen/food. Left top: Dawn and Sunday Morning Girls; Right top: Dawn with all the Sunday Morning Girls. Left bottom: Sunday Morning Girls relaxing at Dawn’s home. Right top: Sunday Morning Girls huddle and read a birthday card sent to one of the girls by a USA supporters. Right bottom: Dawn takes girls out to eat for the very first time. Dawn’s early walks have given her deeper insights into the many needs in Ghana, more specifically the needs in her community. The widespread lack of running water, electricity, indoor plumbing, and access to education and hunger were sobering realities. But a chance encounter with a group of girls one morning gave her insight into something else – the hunger for mentorship. Left: Children at Dawn’s Annual Holiday Party; Center top: Triplets helped by goodfundme efforts. Center bottom: clinic in progress at Feyaise. Right top and bottom: high school students and elementary school students helped by USA supporters. The needs she sees each day are overwhelming at times. But she views each need and each challenge with a sense of optimism and hope because in the short time she has been there, she has seen the impact her efforts have had on so many lives. “Many of my friends have visited me since I’ve been here. And everyone who visits engages in helping, teaching and sharing their expertise. And when I see a need, I send out a note and ask people to help donate and they do what they can,” said Dawn. Saving the Triplets – gofundme effort raised $1000 to help abandoned mother of triplets start a small business to take care of her children. Scholarship Program – funding sponsors 36 students from K-12 so they can attend school daily. The Desk Project – funding raised built 50 desks for senior and primary school students. Water Well Project – funding is being raised to dig a well to provide free water that will serve an entire community and can be used as a source of income. Health Clinic Project – ongoing funds are being raised to build and staff a clinic in the village of Feyiase in honor of Dawn’s mother; project is currently underway and a portion of the clinic will open late this year. 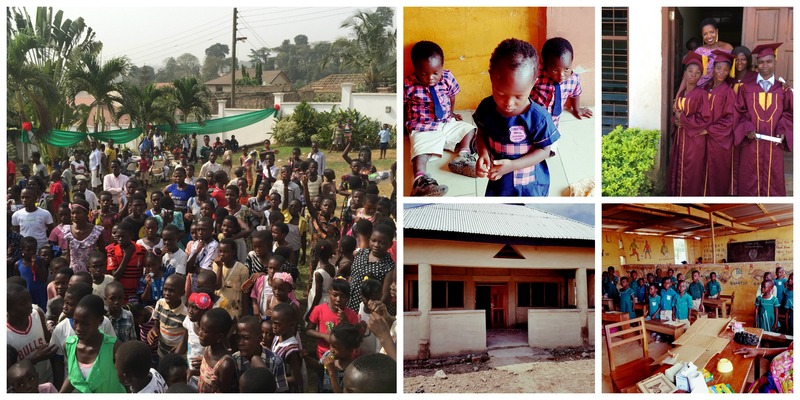 Christmas in Ghana Annual Holiday Party – annual event held at Dawn’s home; funding provides food, schools supplies and gifts to over 300 children each year. Barrel Project – friends across the USA provide donated school supplies, gently warn shoes and clothing which are shipped in barrels from the states then distributed to local children and schools in Ghana. Business delegation visit – collaboration with African Focus Inc. (AFI) and Los Angeles KJLH Radio presented U.S. delegates with potential business opportunities and retirement options in Ghana. Dawn realized that the work and projects she has been involved with will need continued support. 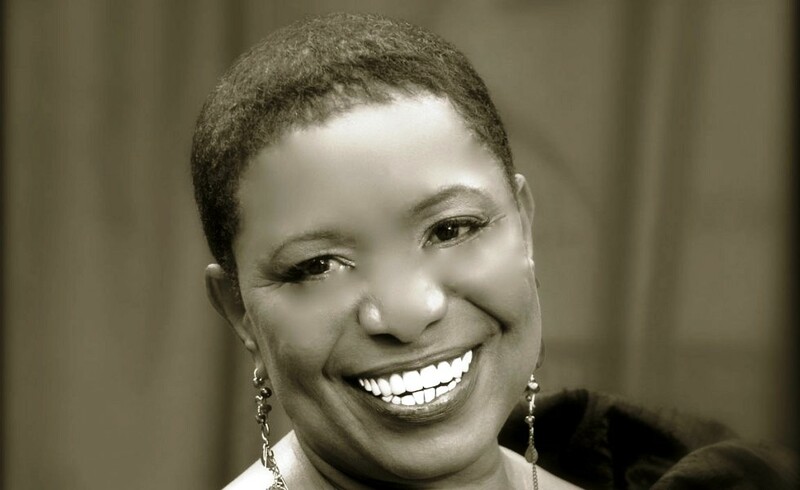 She established the Bridge to African Connection foundation, a 501c3 organization dedicated to improving the quality of life for women and children and helping them become self-sufficient. 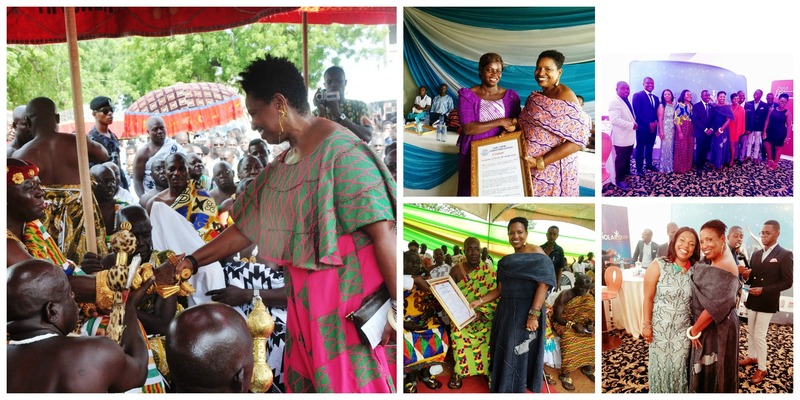 The donations she has received have greatly helped to support ongoing as well as new projects. All donations are tax deductible. 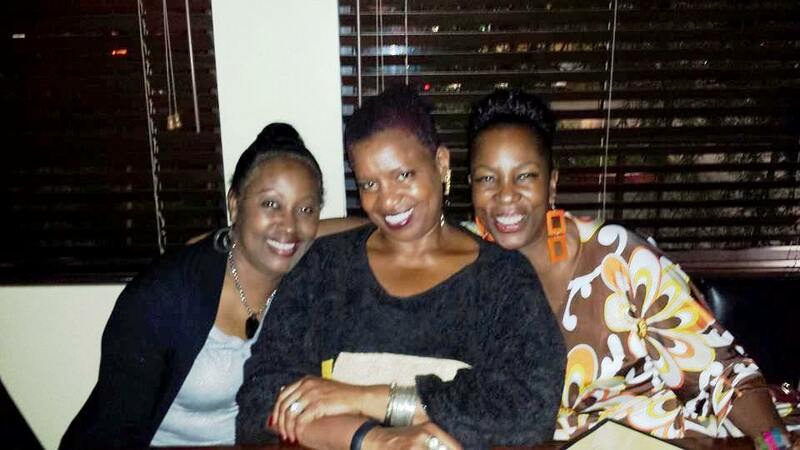 Dawn with Angela Hoffman (right) and Veronica Hendrix (left) at Post and Beam Restaurant in Los Angeles, a few days before she left for Ghana. Dawn says her work in Ghana is rewarding and fulfilling. Her days are full and there is so much that needs to be done. But when she does have down time, there a few things she misses about her life in Los Angeles like dining out at restaurants with her girl friends. Other things she misses are Mexican food, Cesar salads, and baked goods. In Ghana fresh fruits are enjoyed as desserts and not baked, sugary goods. The absence of cakes, pies and cookies particularly during the holidays have been a huge adjustment. For the most part, Dawn says Ghanaian cuisine is very simple yet well seasoned with an array of spices. Her diet consists of rice dishes, soups and sauces, fish like wild caught Tilapia, avocados, okra, tomatoes, plantains, coconuts. Fresh fruits like, watermelon, lemons, oranges and mangoes are plentiful too. Left: Dawn’s cook Jennifer prepares all meals. Right: Kellie Willie Kontumri (Spinach family), black-eyed peas and fried plantain. 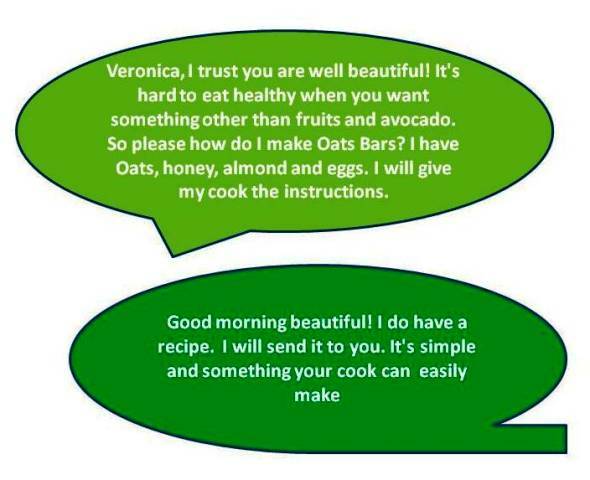 When Dawn asked me to create a recipe using nuts and oats, I got busy. I wanted it to be easy and quick and a recipe that could give her a energy for the array of projects on her plate.Here’s the Easy Granola recipe I created for Dawn. And the best part is, it doesn’t require any baking. I sincerely hope you enjoy it too. 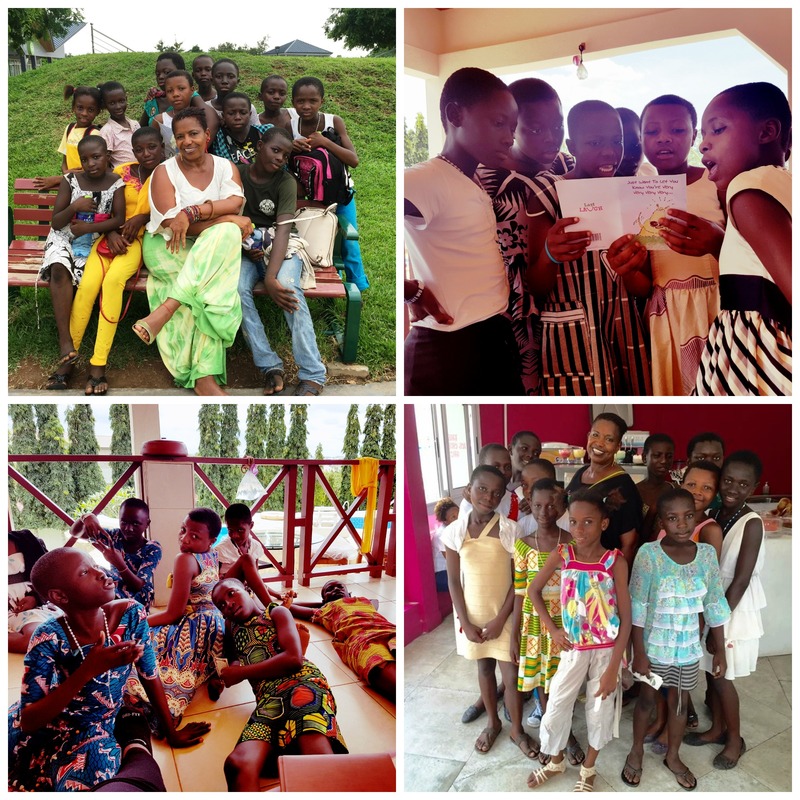 This holiday season I sincerely hope you will consider helping Dawn continue her work by donating to Bridge to African Connection foundation. 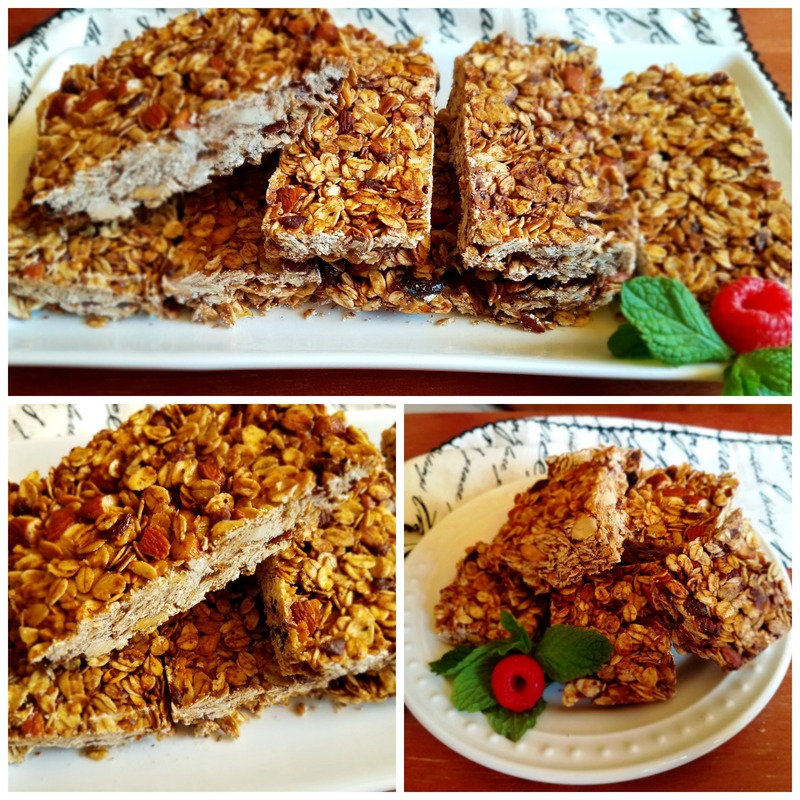 Top: Easy No Bake Granola Bars plated. Bottom left: Close up view of bars. Right: Easy No Bake Granola cut in squares. 2. Combine the oats and roughly chopped almonds and spread on to a lightly sprayed baking sheet, then bake 7-10 minutes until lightly toasted. Transfer to a large bowl. 3. While the oats are toasting, combine the butter, honey, brown sugar, vanilla extract, nutmeg and salt in a small saucepan over medium heat. Cook until butter melts and the sugar completely dissolves, making sure to stir occasionally. Pour the butter mixture over the toasted oats and almonds and add the cranberries and raisins. Mix well. Let cool for 15 minutes, then stir in mini chocolate chips if you are using them. 5. Cover with plastic wrap and place the pan to the refrigerator and chill for 2 hours. 6. After the granola has cooled completely, cut it into 12 bars or 24 squares. This entry was posted in Foodies and tagged African Focus Inc, America, Angela Hoffman, Baldwin Hills, Bridge to African Connection, California, caviar, Cedes, collard greens, Comfort Food, cooking, Dawn Sutherland, Facebook, Feyiase, food, foodie, Ghana, Ghanaian currency, granola, Kellie Willie, Kellie Willie Kontumri, KJLH Radio, Kontumri, Kumasi, Kumasi Ghana, Los Angeles, Operations Crossroads Africa, philanthropic, philanthropy, Post and Beam Restaurant, Skype, travel, Xerox, Xerox Corporation. Bookmark the permalink. Amazing story!!! Thanks for sharing Veronica! Inspirational……………………………. Thank you so much! Dawn is an amazing woman and what she is doing in Ghana leaves me speechless. Great story. I look forward to trying the granola! Thanks. And it works well as cereal too…just break it up in a bowl and add milk.